Discussion in 'Hats' started by deadlyhandsome, Apr 1, 2018. 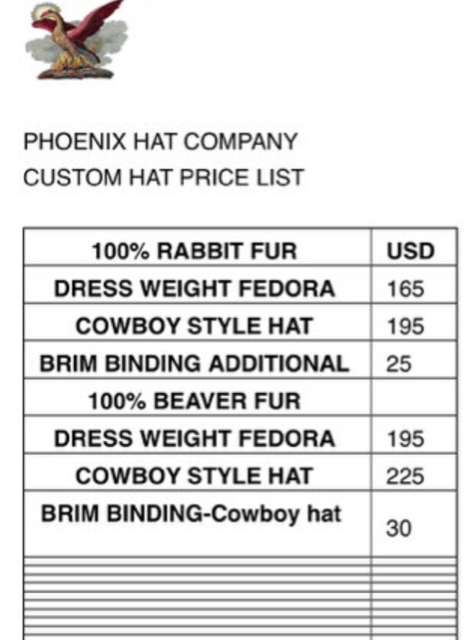 I recently ordered a custom hat from the Phoenix Hat Company which is the the creation of our own @humanshoes. I’m his first long distance (email) custom order. He has been a pleasure to work with and he is fast responding to any questions. He also doesn’t oversell his hats and makes certain you know what you will be getting and what his limitations are. Who could ask for more? Rick (humanshoes) was upfront with explaining that his hats are made almost exclusively by hand and that the pouncing/finish won’t be as fine as hatters who have made huge financial investments in equipment. That said, his hats look great and I’m certain that they will fill a niche as a rugged yet good looking fedora. His prices are also incredible for what you get. Rick apparently has lots of irons in his fire and isn’t only a hatter. He quoted an approximate eight (8) week delivery time, but that’s subject to change due to his other commitments and the availability of the hat body you want being in stock. He really doesn’t have much of an online presence yet, but he can work with you and send and receive photos as desired. It’s natural beaver with a 6” open crown and 2 5/8” bound brim on a good-old #52 block. The pricing is a bargain and I can’t wait to receive the hats and provide photos and a thorough review. Like I said, up until now Phoenix Hat Company has only been serving the locals and this is his first long distance order. If you’re interested you should hit him up with a PM here at the Lounge. I have high hopes! The shop also does repair and alteration work on hats. Additionally, he makes hat making tools for sale at very reasonable prices. Just Daniel, Dm101, TunedVWGti and 12 others like this. Looking forward to seeing your new hat with head shots. Congratulations. andresdelgado, Rogera and deadlyhandsome like this. This price list was current as of January 2018. Confirm prices with Rick. Dm101, Perry Underwood, BobHufford and 3 others like this. @humanshoes out of curiosity how are you doing brim bindings? By hand or machine? I hope to soon use my 108w20 for both bound brims and welted brims, I have an attachment that should get the welting going once I master it and just ordered an attachment for doing ribbon binding. Both made by Tennessee Attachment, not cheap but good craftsmanship. I’m not humanshoes, but he told he that except for a “hat spinner” it is all by hand. You’ll need to send Rick a PM if you want details or to talk shop. Hey Brent: just gotta say, i really, really like the top one just the way it is. You can’t beat a #52 imho. That hat, ribbon work, the whole thing is elegant among other things. Look forward to your review. And the prices...wow!! Cornshucker77 and deadlyhandsome like this. Thanks Bowen. Like I said, I copied it from someone else here on the Lounge. I too thought it was perfect so I didn’t change a thing. Cornshucker77 and AbbaDatDeHat like this. 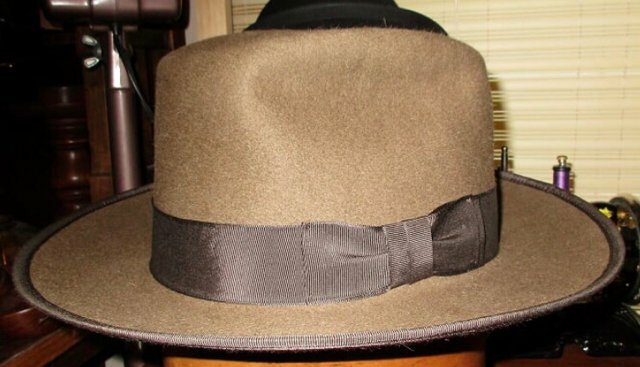 That top hat pic looks like one @Michael R. had made in natural beaver felt. I also can't wait to see your hat with lots of head shots and detail pics. deadlyhandsome and Michael R. like this. That is my Hat Tuk , good eye . Mike Gannon hooked me up , @humanshoes will do a good job . The brim is actually 2 7/8" on mine , open crown is 6" , #52 Block . AbbaDatDeHat, ChicagoWayVito, deadlyhandsome and 3 others like this. I hope you don’t mind me copying your hat. I figure why mess with perfection? I did spec a 2 5/8” brim on mine but now you have me second guessing that call. In any case, Gannon built you a spectacular hat. I’m actually having Michael making me one right now in bone that I copied from Eric (Short Balding Guy). I’m shameless when it comes to plagiarizing hat designs. Tukwila, Michael R. and Short Balding Guy like this. jlee562, Tukwila, BobHufford and 2 others like this. Mustang Mike's Hats, Short Balding Guy and Michael R. like this. Thanks for posting that pic Michael. 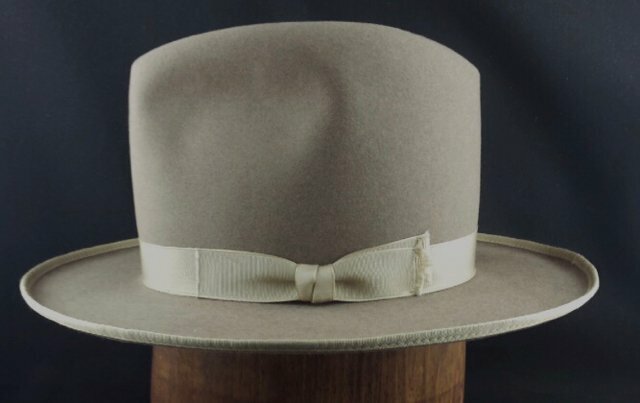 It shows me how the hat will look with ivory or cream ribbon as opposed to light beige or sand. I like them both. At any rate, I'm waiting for sample cards from a ribbon supplier who carries over 60 different colors of cotton/rayon grosgrain so there should be plenty for DH to choose from. They even list a color named "skin", which has me wondering, "who's skin?". Rmccamey, Michael R., Tukwila and 1 other person like this. YOWZA! Killer lid... lids. Great to see that style kept alive! I wonder if @alanfgag has more photos of that one for our viewing pleasure. I'd love to see more shots at various angles and the crease, liner, sweat, etc. Michael R. and deadlyhandsome like this. Welcome @humanshoes , Alan said the ribbon was cream with almost 100 yrs of aging . My Hat has beige or tan ribbon , still looks great though . Skin would freak me out , sounds creepy . deadlyhandsome and Tukwila like this. Shades of Hannibal Lecter. I made his hat while enjoying "some fava beans and a nice chianti". Hah! Benny Holiday, Michael R. and Tukwila like this. That must be a favorite. I have one like that from Art. Can't wait to see yours DH! belfastboy, Michael R. and Tukwila like this. Redfokker and Tukwila like this. I finally found some time to practice on this Winchester beaver/rabbit blend hat body with my JW Hats curling shackle. This one started out with a 3 1/4" brim and ended up with exactly 3" after the 1/8 size pencil curl. There is definitely a bit of a learning curve here. The process reminds me of something my grandmother used to tell me, "Simple is not always easy". TunedVWGti, Cornshucker77, Perry Underwood and 7 others like this.